I have spent the past two weeks making leaves from book pages and most of them have been painted the colors of fall. I decide to leave one batch of oak leaves unpainted - just the natural color of an aged book - and create a fall tablescape in natural tones. These I attached to branches painted black. 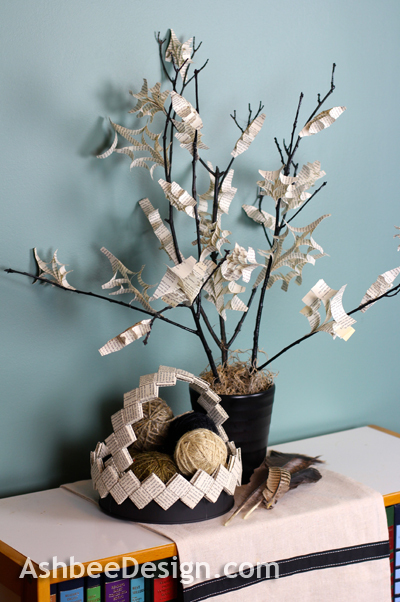 I made three branches, added them to my book page basket (tutorial here) along with a scattering of found feathers for a fall arrangement in muted tones. 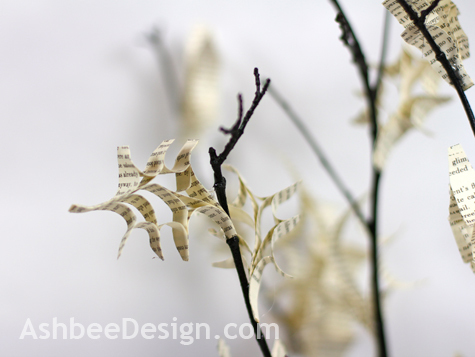 I started by making a slew of leaves from strips of pages from old books. I posted extensive tutorials on how to make these leaves here. I made a bundle, painted some for other projects but left about 30 natural for this arrangement. Creating the arrangement started with a hot pink flower pot my daughter gave to me when I visited last week. I knew it would great spray painted matte black. 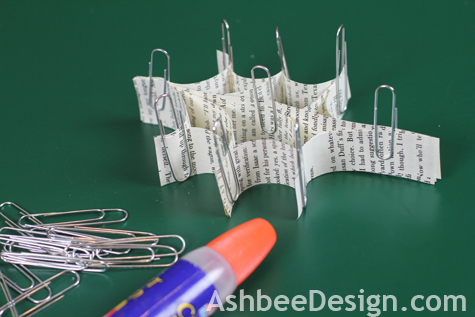 I then experimented with an idea I'd seen on Pinterest from Doodles, Dabbles, & Dreams. 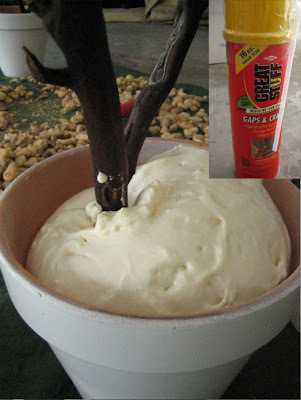 I used Great Stuff insulating foam to hold the sticks in the pot. I am pleased to report that it worked like a charm and better than many other things I have tried. I even hard a partial can left in the closet! 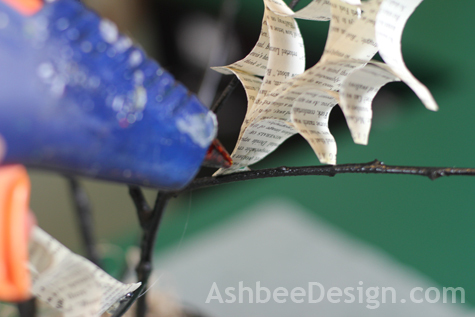 Recycled books, pot and finishing up old supplies! 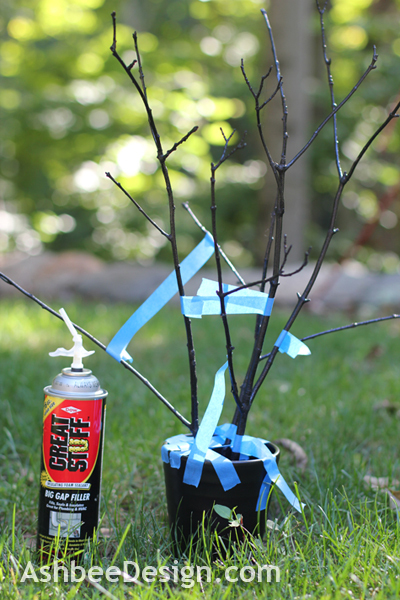 After spray painting some twigs black, I arranged them using painters tape to hold them in place. I sprayed the foam into the pot trying to not over fill because of the foam expansion. I left it over night to cure and the results are excellent. The branches are held firmly in place. It made working on it much easier. 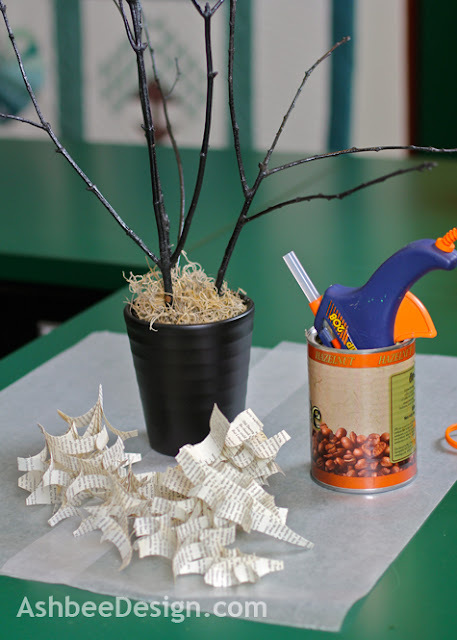 I used hot glue to glue the leaves onto the branches. Notice the coffee can? It has about 2 " of small rocks in the bottom and I use it as a holster for the hot glue gun. It keeps it off my work surface and it doesn't matter if some of the hot glue drips on the rocks below. I put a small amount of hot glue on the leaf and then held it next to branch. I had a pencil ready to push it in place with out burning my fingers! I added some other treasures from my collections to the grouping and took photos to share. But then I also added a touch of fall color to the arrangement. I think I love the sereneness of the all natural interiors but my inner self pops out into color every so often! 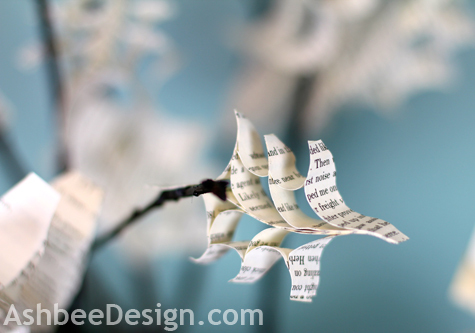 Dont' miss all my other posts about the other arrangements I have made using the book page leaves, and the tutorials. Links to all below. I'll be sharing this at the following link parties this week. Check them out for other fall ideas. It has been a project with many different applications! Thanks for visiting and commenting. 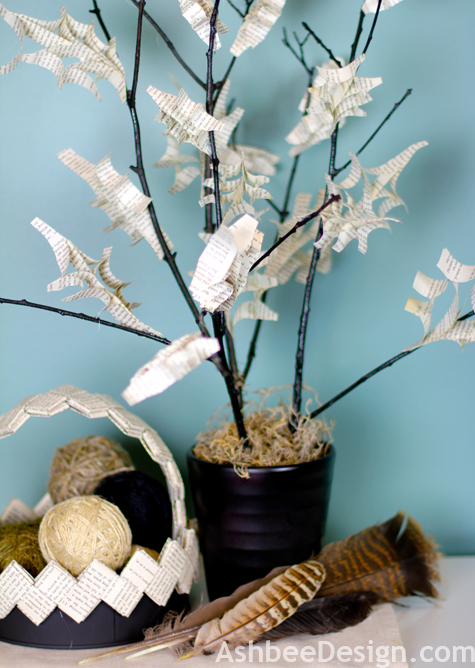 Thank you for sharing your creative touch with Potpourri Friday! 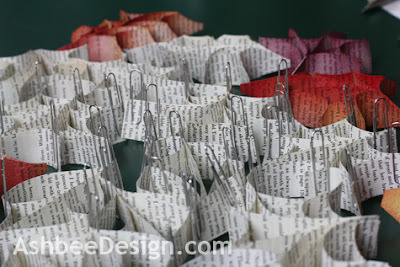 Hi Marji: Your bookpage leaves are lovely--I think they could work very nicely for winter holiday decorating as well! Absolutely! But then there are so many ideas for holiday decor. So pretty! 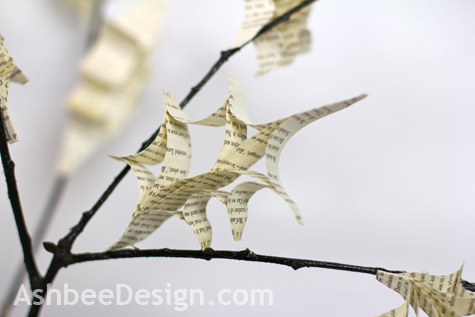 I love this version of your bookpage leaves too! Thanks so much for linking up at Romance on a dime! 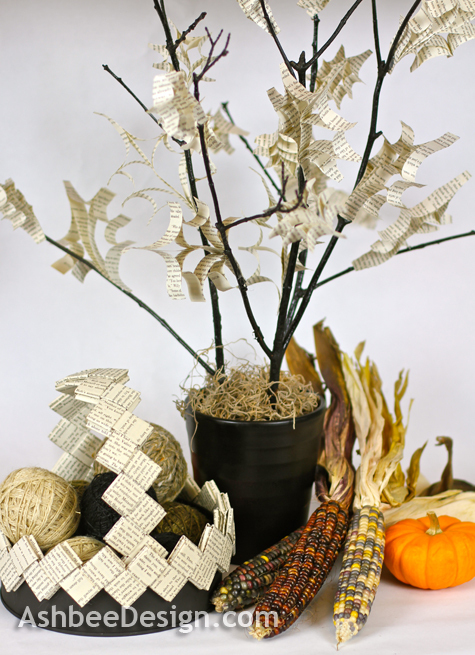 I am so in love with the book page leaves! You just showed me my next project! Stopping by from Rance on a Dime! Have fun making them and send pictures when done. It is a project which begs for variations.